When you are ready to install HelloSign for Oracle Documents Cloud, you should already have a JSON file on hand to install that would have been sent to you via email. Log into your Oracle Documents Cloud instance and click on your email located on the upper right corner of your page. Then, select "Administration." Then, using the dropdown menu at the header of this page, select "Applications." Under “Custom Applications” select “Add.” This will bring up a dialog box where you will select the HelloSign JSON file you were provided. then open. Then, click on the small paper icon on the right side of the HelloSign line item. This will prompt a popup that will ask you to enter your Oracle Cloud credentials as well as your HelloSign API key. To get the API key, click on the link in the pop up, then copy the API key and paste it in the box. Then, select "Update"
Your integration should now be live! The first option would be for the user to go to http://hellosign.com and select "Sign up free" to create a username and password. All they need to do is use the email they will be using for Oracle Documents Cloud and create a password. Please note: This is the only time they will be using the HelloSign end-user website. They will need to use the signing capabilities from within Oracle Documents Cloud to take advantage of the integration! The second option would be for the Oracle Admin to invite team members via http://hellosign.com. This will trigger an email invitation to their teammates. To do this, the Oracle Admin needs to log into our end-user, website-based product at http://hellosign.com then click on "Team" to the left side of the page. Invite members by entering their email address and clicking "Invite." 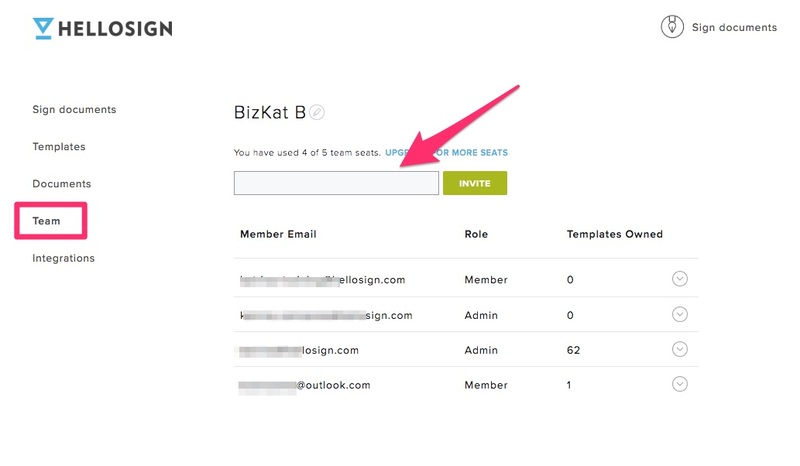 Each of your team members will receive an email to confirm their addresses and allow them to enter their password. Please note that this is the only action they need to complete on our website! To use the Oracle Documents Cloud integration, they would need to go back and initiate signature requests there.